Famous Japanese artist Yoshitaka Amano serves as both writer and artist for his project, Mateki: The Magic Flute, based on the opera, The Magic Flute by Wolfgang Amadeus Mozart, Which tells the story of a prince battling evil forces to rescue a princess. 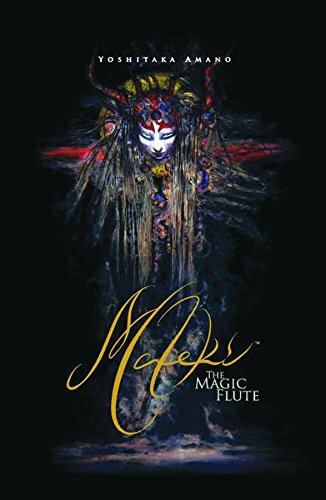 Note - "Mateki" (magic flute) is the Japanese name given to a particular make of flute that is extremely responsive to the artists personal playing style. Yoshitaka Amano first gained fame for his work on Gatchaman as well as Vampire Hunter D and from there expanded to other creative areas including the visual concept of the game Final Fantasy. In 1995, he began making lithographs at his studios in Paris and New York, and launched two large exhibitions in 1997 and 1999 in New York, including his famous THINK LIKE AMANO show. He also held numerous exhibitions at various prestigious venues in Japan, including Ueno's Mori art museum. Amano's work in Neil Gaiman's Sandman: The Dream Hunters won critical acclaim internationally, being nominated for the Hugo Award and winning a coveted Eisner Award.